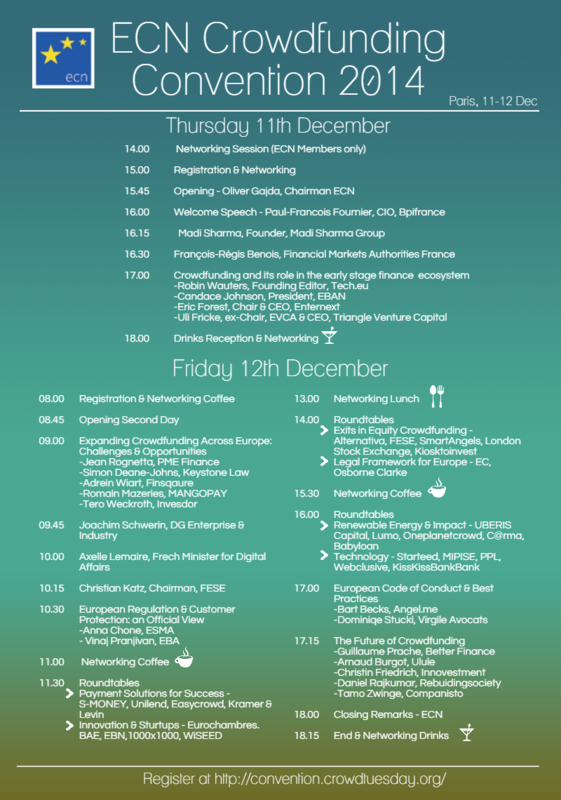 Some 300 key stakeholders in Europe’s crowdfunding, innovation and early-stage investing sectors met at the ECN Crowdfunding Convention on 11 – 12 December 2014 in Paris. The Crowdfunding industry is the fastest growing financing source for Small and Medium Businesses in the World, with an estimated value of just under €1 billion in Europe alone for 2012 and some €2 billion estimated for 2014. It is a major, long term wave that redefines the shape of how things get funded in cohesion with open innovation and as part of the collaborative economy. The ECN Crowdfunding Convention is the reference event for the crowdfunding and early stage investment industry in Europe, gathering top-ranking decision makers from a large variety of industries to discuss the rise of this disruptive sector. The event was involving all relevant stakeholder groups and encouraged exchange of best practices on funding culuture, innovation and early stage businesses. ECN is happy to have welcomed the European crowdfunding industry and all related stakeholders in Paris, on 11-12 December 2014, in order to promote crowdfunding to international markets and support the European Commission’s efforts to draw up a harmonised European regulatory framework, connecting decisions makers from across Europe.